Finding storage space in a small bathroom can be a challenge. The random collection of bottles and sprays lined up on your bathroom counter might look more like a city skyline than a serene spa. Spare linens and extra toilet paper might have to be inconveniently stored in another room. Cords from hairdryers, straighteners, and curling irons constantly tangle into a maddening, time-consuming mess in your vanity drawer. Having minimal storage is frustrating enough, but then there’s the aesthetic aspect of small bathrooms. Sometimes they feel more like a dark, stuffy, crowded closet than an actual bathroom, especially if there are no windows letting in natural light. Fortunately, there are some ways to maximize the space in a small bathroom to make it feel larger and much more functional. 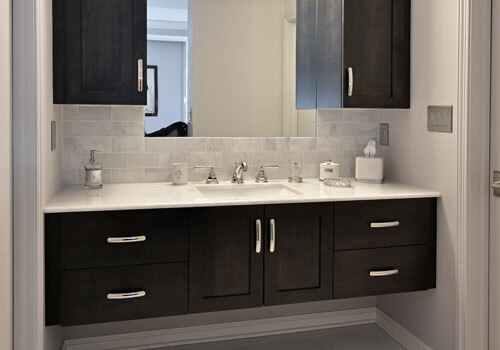 Add custom-built vanities, cabinets, and shelves to maximize your space. Typically equipped with the standard vanity, towel rack, and toilet paper holder, small bathroom designs rarely take advantage of the total space available. Custom-built vanities, cabinets, and shelves make the most of vertical space, awkward corners, and narrow spaces, as well as incorporate convenient built-in storage options for toiletries, linens, cosmetics, and hair tools. Install open shelving. In a tight bathroom, open shelving is an excellent way to add more storage while visually keeping the space—well—open. This type of shelving is ideal above a toilet, on the wall next to the sink, above a towel rack, below a vanity mirror, or even above a door (though you’ll likely want to store things there that you rarely reach for). Open shelving gives you a way to keep frequently used items within convenient reach, freeing space in your vanity for items you don’t use as often. Open shelving is also a great solution if you have a pedestal sink that doesn’t offer below-the-sink storage. Consider recessed, built-in storage. On interior walls, you may have the option to add recessed shelving or cabinets, depending on where your electrical wiring and plumbing pipes run inside the walls. Recesses are a great way to maximize storage without taking up a lot of space. A medicine cabinet could be built right in to a wall near the sink, or shelving could be built into a wall for convenient storage of towels, toiletries, and more. When remodeling a shower or tub, adding recessed shelving to shower walls gives you a convenient place to keep toiletries. Install all-glass shower doors. Nothing makes a small bathroom feel smaller than a wide shower curtain that visually closes off a large portion of the room. Glass doors open the space and brighten your shower, and custom options are available for virtually all sizes of tubs and showers. Glass options that include texture or a pattern can add privacy and interest while still allowing light through. Clear glass, on the other hand, provides a way to showcase a beautifully tiled shower or tub wall. Add towel bars or hooks to the back of the bathroom door. While you’ll still want a convenient towel rack right next to the shower or tub, it’s always nice to have a few spare towels on hand. Extra towel bars on the back of the bathroom door could save you a trip to the linen closet when you need a clean towel. Hooks on the back of the door could be used to hang robes, sleepwear, shower caps, and more. Add or change lighting. It’s amazing how much a little more light can really open up a dimly lit space. Adding additional lighting around your vanity or mirror, above a shower or tub, or even task lighting beneath a shelf or cabinet can make your small space appear brighter and more open. Sometimes all you need is to upgrade existing lighting. Make sure your mirror is large enough. Mirrors are an excellent way to visually expand the space in a room, so if your vanity mirror isn’t fully taking advantage of the space above your sink, consider getting a larger mirror. In general, mirrors should not exceed the width of your vanity, and ideally should be 2-4 inches narrower than the vanity. If your small bathroom isn’t living up to its potential, a custom-built bathroom could be a perfect solution. Give us a call to discuss how we can help!